A truly Digital CV... have you done yours? QR code (short for Quick Response) is a specific matrix barcode (or two-dimensional code), readable by dedicated QR barcode readers and camera phones. The code consists of black modules arranged in a square pattern on a white background. 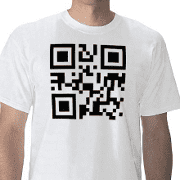 The information encoded can be text, URL or other data. And why is this relevant to finding a job? It will allow you to Compose your digital CV, and once the recipient receives the code and they have a smartphone or a barcode reader, they can read your CV..